You stand where you are and continue contemplating the directory. After about half a minute, you hear a door open and footsteps. You start to think maybe it wasn't a good idea to stand out in the open. Before you can react, a security guard appears from the hallway who looks only semi-human, even aside from the fact that he looks like he is about 8 feet tall. He stops short, and for a moment, looks as started as you are. He bellows, "You! How did you get in here? That door is foolproof!" You respond, "Then I guess I'm just a fool cultivating my own nonsense." You realize this probably was not the best way to respond, but you often joke and become sarcastic when you are frightened. He begins walking toward you very quickly. You take half a step back and bump up against the wall. "Can I...can I just go home," you ask. He responds, "You can go to hell," as he raises his arm over his head. You close your eyes and only feel a moment of pain as he swings and your head separates from your body and rolls across the floor. Go back to the previous post and vote again. You enter the elevator bank. There are six elevators. The doors to five are open, but there are no elevators; only pits that you can't see the bottom of. You press the call button. Just after you do, you hear a door open and footsteps. The elevator chimes, and then doors open. Immediately after the chime, you hear a deep voice: "Who's there?" Startled by the voice, you quickly step into the elevator and turn. From across the lobby, you see a security guard emerge from the hallway who looks only semi-human, even aside from the fact that he looks like he is about 8 feet tall. He stops short, and for a moment, looks as startled as you are. He bellows, "You! How did you get in here? That door is foolproof!" He begins running toward you. You glance quickly at the elevator buttons. Many appear missing or broken, except the ones listed below. There also appears to be some sort of card scanning device. The doors begin to re-open. The guard lunges for you through the opening doors just as you again slam the "door close" button in a panic. The doors snap closed, severing his hand, which falls to the floor a few feet from you. Sick at the sight on the ground before you, you turn away momentarily and again try to get your breathing under control. The shrieking on the other side of the door reminds you to get moving. You press "17" and feel the elevator begin to move. Before long, the LED indicator above the buttons indicates that you have arrived at the 17th floor. The doors open, and you cautiously take a look outside, but don't see anything menacing. You don't want the guard following you, so you press the "hold" button to keep the elevator on this floor (you're welcome), and casually step out, leaving the severed hand where is. You are in an elevator bank with a frosted glass door to the south. You do not see anything moving on the other side of the door and do not hear anything. "I don't think I'm going to be able to get out of here, but I hope someone else at least sees this warning and is able to get away. I had no idea what they do here. They just took her in, and I swear they're going to murder that poor kid. It's what they do. Get out while you can. It's my turn next." You do another quick scan of the room, but don't see anything helpful. ...which makes you remember the "map" and try to remember whether you've been given any clues about how to use it. I'm dropping lots of clues for you guys to help you figure out some of the better choices in the game. It's up to you guys to use them. E) Say "Diepen and Haven, MD". If nothing happens, say "Floor 17". Then look at the map. "Hello? Yeah, I'm here. I'm a doctor. It's not like I work yoru standard nine-to-five, but I'm leaving after I finish up some of this paperwork. . . . Yes, of course I'm here alone. Do you know what time it is? That door gets locked at night by nine o'clock. . . . Oh, really? Well, the way I see it, that's not my problem--it's yours. I know all about your little project that you've got going on upstairs, remember? And, frankly, ever since we entered into our little "partnership," all it's done is cost me business. I'm happy to hack them up for you, but that's where our relationship ends, okay? . . . Wait--already? But you said we've have more time before this place ended! I can't relocate again that quickly! . . . Okay, fine!" You hear the sound of a phone being slammed down. Although you briefly thought about asking the doctor for help, you are beginning to think that might not be such a good idea. You quietly enter the file room and see shelves full of what appear to be medical files. You begin looking through some of the files and immediately notice that you cannot read them because they are written in a language you have never seen before. The files also each contain various pictures, in roughly two sets. The first set of pictures are of real people, with their faces (and in some instances, other parts of their body as well) marked up as if prepared for some sort of cosmetic surgery. The second set can only be described as grotesque mutilations. You flip through one file of a tall, attractive-looking young woman. In one photo, she is holding a handbag that looks very similar to the one you saw in the waiting room. You continue flipping through her file and come to the second set of photographs. There are various pictures of what appear to be sawed-off limbs. The last picture is of one of the dwarf-creatures you encountered outside in the city. It has bloody fingerprints on it, and as you pull your hand away, one of the fingerprints smears and you realize the blood is still wet. You drop the file and back away. You wonder to yourself whether the blood is still flowing as you ponder your next move. You go back out into the hallway and circle all the way over to the men's room. As you pass by the door to surgery room B, you notice it is boarded up. The men's room door is locked. You enter Surgery Room A and your nose is immediately assaulted with the smell of decay. Directly in front of you is what looks like a patient prep area that can be curtained off. The curtain is drawn back and a set of clothes is neatly folded on the chair. Over to the left is a larger, curtained-off area with the curtain drawn back. Next to it is a small, movable metal table with a combination of what look like surgical instruments and implements of torture. One particular items catches your eye. It is a huge knife of some sort. The wicked blade is the size of a commando knife, but is curved. You ask yourself why such an instrument would be necessary in a surgery room, but aren't really able to formulate a reasonable answer. You do, however, realize that such a thing could come in handy, so you take it. As you do, you hear a soft rustling from behind the curtain. You slowly draw back the curtain and see a gurney with a severely mutilated corpse on it. The stench alone almost knocks you to your knees before you can process what you are seeing. What is left of the face and torso have markings drawn on them, and there are deep, rough gashes that look more like they were made by a butcher than a surgeon. But what catches your eye is the movement in a deep gash that runs from the base of the corpse's throat to its navel. The corpse itself is not moving. What is moving are creatures that roughly resemble maggots, but are roughly the size of your index finger and have faces that are somewhat humanoid. You involuntarily let out a slight yelp and take a few steps back, knocking over the instrument table, which crashes to the floor, scattering instruments everwhere. The sudden noise apparently gets the attention of some of the maggot creatures, who interrupt their meal and stare at you. One lets out a hissing sound and launches itself through the air at a speed that catches you offguard. It sinks its tiny yet sharp teeth into your forearm as it lands, and you feel an intense stinging sensation. You flail your arm madly, and it loses its grip. You quickly stomp on it without thinking, and it squishes beneath your feet with a sickening "pop." You try to control the fear you feel rising within you, but as soon as you showed it, a few others make the same hissing sound. You can see about a dozen, total. You make a dash for the door. As you open the door, you see a man in a white lab coat with a surpised look on his face. "What the--?" he exclaims, just before he hits you with something and you feel your body go limp as you black out. You awaken some time later, laying on a gurney. The room looks similar to the one you were just in, but reversed. Your head hurts. The doctor is standing over you, grinning. "I didn't expect you to wake up so quickly. I guess the best stories really do repeat themselves. I'm not sure how you got in here, but in case you didn't notice, we're closed." "Oh, right then," you say. "My mistake. I'll just be on my way." The doctor's eyes narrow. "You won't be going anywhere. At least, not until after your procedure." He picks up the knife off the instrument table, which is next to your head. "Wh-what procedure? Look--let me please explain! It's all been circumstance. I really shouldn't be here. I don't even know what this place is or who you are. How about I just go and we forget all about this, okay?" "I'm the spider who spins his web. And this is my parlor," he says menacingly as he uses the long, curved blade to slice open your shirt. You aren't happy about this at all. For one thing, your vintage Ozzy Osbourne concert shirt now only says "Oz" and "Zy." He puts the blade down on the instrument table. "But I suppose I should strap you down first so you don't hurt anymore of my pets." He looks away for a moment and reaches for some straps. ***hint (which I am giving you because I did not expect that you would be in this position this early, and you do not have everything you were supposed to have when you arrived here): You have been given several clues about what you must do next. They may not be the most obvious, but they are definitely there. There is one and only one correct answer. All other options will either eventually or immediately get you killed. Think carefully. Go back and read the above narrative and previous posts and try to put the clues together. Feel free to post your reasoning for your answer. I would like to see whether anyone actually reasoned it out correctly as opposed to just getting lucky. Wow. B, C, D...you guys are all over the place for a change. I guess I'll have to let this one sit for a while more. But can any of you tell me why you picked your answer? Again, there is a reason the right answer is the right answer. If you talk it out amongst yourselves, you might figure it out. Actually, I've been thinking about this a bit more. I still don't think calling for help would do any good, we have no reason to believe that anyone is here who would help. Waiting for a better opportunity could still just get us tied down. He doesn't seem at all concerned you might run away. The only reason he wants to strap you down is so you don't hurt any more of those worm things. If he thought you had any chance of running away when you woke up he would have tied you down when you were knocked out. The doctor says "I'm the spider who spins his web. And this is my parlor,". This could be another clue that running will do you no good. If you were stick in a spider web struggling (running) could just entangle you in that web even more. This reminds me of the scene in The Lord of the Rings when Frodo is caught in Shelob's webs. He struggled trying to pull himself free and that just got him caught in more webs. When he started cutting at the webs with his sword he was freed. Maybe, we're supposed to cut our way out of of his the Doctor's web by killing him with the knife. I don't really have much on which of the two knife options we should pick. The only thing I really have to go on is the doctor saying "I didn't expect you to wake up so quickly. I guess the best stories really do repeat themselves.". He's probably referring to the dead man you found in the other surgery room. But maybe this is a clue that we are supposed to attack the body instead of the throat. The man in the other room was killed by a cut from the throat to the navel, down the body. Maybe we are supposed to make this story repeat itself by killing the doctor the same way he killed the other man by slashing him down the body. It's not much to go on, but I I've changed my answer to A. As he looks away, you decide to seize the moment because you might not get another chance at this. You take a deep breath and force yourself to overcome your fear. In one movement, you turn on the gurney and reach for the long-bladed knife and then lunge at the doctor. As the knife tears at his body, he screams in pain and jumps back. Out of pure pain reflex, he moves faster than you think you've ever seen anyone move, grabbing a saw-like instrument from the instrument table and striking you with it with such force that it not only pierces your chest, but goes completely through you and impales you on the gurney. The last thing you see is the doctor stabbing you over and over and over in a berzerker rage. You are dead. I'm trying to decide where to put you now. I want to put you back to where you first see the maggot creatures and make you decide again whether to fight or run, but I'm afraid you'll try just avoid the whole confrontation. Oh well. You're back on the gurney. Same options as before. There is a further hint below if you scroll down below the choices. ...He looks away for a moment and reaches for some straps. Hint: This place is built on two themes. First, various elements are based on the being that controls this particular world. Second, and most importantly for this puzzle, this world is based on a certain very famous fictional place. That is the key. Figure out what the place is, and who your chacter and the doctor's character represent. Since, in the doctor's own words, the story should repeat itself, you should make sure to do whatever your counterpart in this famous story did, and you should survive. If you really can't figure out what the famous fictional place is (which you should, given all the clues about it, including me flat out giving you the name of it in one post, I'll give you further hints. Did you guys read the hint? I honestly don't know where this famous place is... I know if I were to go back and reread, I think I would figure it out, but I have had a headache for 3 days and am not going to... but I don't think E is going to work. Yes I did. But it's either something I haven't read yet or I just haven't caught the hints yet. As he looks away, you scream at the top of your lungs, hoping someone hears you and will come to your rescue. The doctor laughs. "Who are you expecting to save you? Glenda the Good Witch?" His laughing becomes somewhat maniacal as he straps your arms, legs, head, and torso to the gurney. You keep screaming, but are unable to move your head as he takes a huge needle and some very coarse, dirty looking thread and sews your mouth closed. "That was really annoying," he says. "Now I know you're a cowardly little kitty, but I promise you, this next part will not kill you. You'll just wish it did." He begins ripping into your body with his instruments. You feel flesh tear, and bones crack. The pain is maddening, and the procedure lasts for days. There is no anesthetic to numb the pain, but you slip in and out of consciousness. By the time you are done, you can barely form a coherent thought. You are unstrapped from the table and stood on your feet by two guards, one of whom only has one hand. You look up at the doctor, who now seems a lot taller for some reason. He tells you, "You'll have to live outside now with your brothers until I call you." You are unceremoneously brought downstairs and thrown outside into the streets. You spend the rest of your short days foraging for whatever you can find to eat. Every now and then, you see a normal-looking person, and you and other dwarf creatures like you hunt it in the hopes you can kill and eat it. Sometimes, you succeed. You also notice earthquakes of increasing frequency and severity. The last one completely rips apart this strange world that has become your home. You are dead. Do you STILL need more hints than the additional ones I gave you above? If so, read the next post. If you still want to try to figure it out for yourself without spoilers, scroll past the next post. The solution is relatively straightforward. There have been several clues that should lead you to make the connection between this place and a VERY famous fictional place. Figure that out, and then figure out which characters from that fictional story you and the doctor represent, and you will likely find the answer. But note, the answer is not in the move--only the book. One of the characters does not appear in the movie. But even if you have not read the book, this is the 21st century after all. If you figure out what this place represents and which character you are, things like Google and Wikipedia will find you the answer. I am telling you this much because it is a lot more fun, IMO, to know the rationale behind why a choice is correct than to just stumble upon it by luck or because you've simply tried every other choice. This should be enough information. I would recommend you stop reading here and try to figure it out. But there are more hints below, if you need them. "Yes it is. Now stop being a coward and go do what you have to do." . . . The fact that it called you a coward sends you into a rage. From where you stand, there is a road of sorts set with pale, gold-colored stones, leading from the place you stand to the city. It looks like a long walk, but you can make it. There are several buildings, all black. In fact, everything in this place but the road appears to be black. In the center of the city is a tower taller than the rest. You see a light on all the way at the top. It reminds you of a lighthouse. "Follow the yellow-brick road," you say to yourself. The reference almost makes you smile as you walk toward the city. You stare east, back down the yellow road, your eyes on horizon in a steady-set gaze. I guess the best stories really do repeat themselves. "I'm the spider who spins his web. And this is my parlor," he says menacingly as he uses the long, curved blade to slice open your shirt. . . . For one thing, your vintage Ozzy Osbourne concert shirt now only says "Oz" and "Zy." "Who are you expecting to save you? Glenda the Good Witch?" "Now I know you're a cowardly little kitty, but I promise you, this next part will not kill you. You'll just wish it did." Honestly, if you can't guess from all of those, I can't help you much more than that. B. Off with his head! why would a coward have ruby slippers? A reference to the literary work that Gyno is basing this nightmare off of. ...why would the COWARD have them? You are a lion. They don't even fit. As he looks away, you decide to seize the moment because you might not get another chance at this. You take a deep breath and force yourself to overcome your fear. In one movement, you turn on the gurney and reach for the long-bladed knife and then lunge at the doctor. As the knife tears through his throat, he gurgles in pain and begins flailing around. He grabs a scapel from the instrument table and raises it high above you, but collapses and misses his intended target (your chest), and sinks the scapel a few inches into your shoulder before slumping to the floor. You stare at his corpse for a few moments, simultaneously horrified at what you've done and relieved that you're still alive. The up your spine can't get any colder, but your adrenaline overrides the pain in your shoulder as you slowly and carefully remove the scapel and toss it away. You do, however, take the knife again. You see the rest of your things on a chair in the corner and take them as well. You then walk back out into the hallway. A quick look at the plaque next to the door confirms that you were in surgery room B. Use the healing salve on your wounds and wrap them. You enter Dr. Diepen's office. There is a desk with a computer and phone on it, some shelves, and other normal office features. There is what appears to be a family portrait of the doctor with a young attractive woman and two children. The picture has some writing on it: "Happy father's day, daddy! You are our white coat hero." There is another picture next to it of three dwarf creatures posed in the same positions as the doctor's family in the other picture. You find nothing much of interest and go back out into the hallway. The emerald city has been completely burned, and we are expecting the end soon. Tenants and other occupants will be vacated as needed. As you are aware, several floors have already been vacated. Cell blocks B, C, and D, which are now vacant are being permanently closed down. Most of the prisoners from cell block A have been altered and are now gone as well, although we will continue to keep at least one armed guard posted in cell block A. Please keep all areas secure and be vigilant. We expect more invaders may attempt to close down the operation before it is complete. Any invaders with silver shoes should be reported immediately. Access to the Pent house shall remain restricted. There is nothing else useful here that you can see, so you go back out into the hallway. 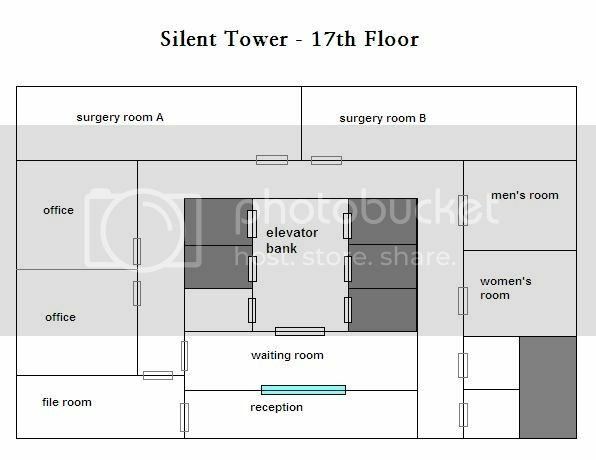 The Silent Tower map links back to the original post where I posted it, but you should print it because as you use it to map other floors, it will be confusing to have multiple links. I would also recommend you write notes on your copy so you know where you have been, which places you can and cannot access, etc. You enter the men's room, and the stench nearly knocks you over. There are pools of blood on the floor, and a small pail of what looks like semi-decayed entrails under one of the sinks. You hear a rustling sound coming from one of the two stalls at the far end of the men's room. You take a step closer, and see a maggot creature fall to the floor. You are repulsed by the sickening monstrous sight. B) Try to look around the rest of the men's room and hope it doesn't notice you. use the large curved knife to keep some breathing room between you and the maggot. You run to the stall, throw open the door and quickly stomp on the maggot creature, which makes a sickening pop under your foot. Success. However, the dozen or so maggot creatures feasting on the flesh of the fresh corpse hanging from the ceiling do not appear amused by you interrupting their meal. They begin hissing at you. You turn and bolt for the door. It is only a few feet away, but nothing in this place is easy, is it? Just as you turn, you feel the first sting on your back as one of the maggot creatures launches through the air and hits you. Luckily for you, it can't get a grip and falls off. Another hits your hand and gives you a painful sting before you brush it away. As you open the door and begin to turn, you see another headed straight for your face. It narrowly misses and hits the closing door. As you stand in the hallway and catch your breath, you hear a couple of soft "pock" sounds as a couple more maggot creatures hit the now-closed door behind you. The stings hurt a little, but you don't have anything to take away your pain. Thankfully, they don't hurt all that much. Status: Stings on back and hand.